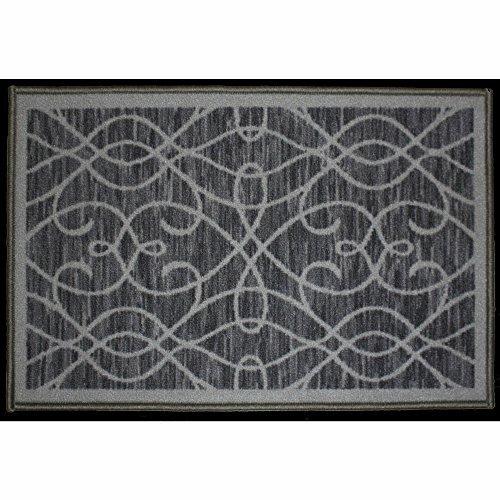 Kashi Home Normandy Collection Contemporary Geometric Inspired Decorative Accent Egyptian Area Rug, Grey, 20" x 30"
The Normandy Collection of Decorative Accent Rugs by Kashi Home is a collection of exquisite area rugs with geometric patterns to help you achieve the contemporary décor you wish. Made in and imported from Egypt, each rug is made with 100% premium polyester and contains a beautiful yet subtle geometric pattern. The Egyptian manufacturing plus the contemporary pattern make this collection of area rugs stand out. It can be placed as an accent rug in many different places in the home or office. Place the smaller ones in the hallway, entryway or bedroom while the large ones can be used to create a tapestry of style on the floor in the living room, dining room or sun room. The Normandy collection of area rugs comes in many different colors and many different shapes and sizes so that you can easily find the one that matches your home. Kashi Enterprises, was founded in 1994 as a distributor and wholesaler of Home Textiles in the United States. Since its founding, Kashi Enterprises has grown and expanded to cover a wide range of products to accommodate our client's needs. Today Kashi Enterprises is a leading exporter of over 9000 household items to more than 18 countries in the Caribbean, Central and South America and the Middle East. If you have any questions about this product by Kashi Home, contact us by completing and submitting the form below. If you are looking for a specif part number, please include it with your message.